This valuable reference gives practitioners complete and authoritative coverage of all aspects of trademark rights, liabilities and remedies in both traditional and emerging forms of trademark use and abuse. In light of the rapid pace of new developments in the law, the treatise addresses every aspect of civil infringement remedies available today in federal and state courts. This treatise provides trademark owners and their counsel the guidance they need to effectively defend and protect their brands and maintain the value of trademarks. It covers all aspects of trademark rights, liabilities, and remedies, as well as the civil infringement remedies available today in federal and state courts, and provides keen insight from expert practitioners. The Third Edition discusses necessary elements in establishing liability for trademark and unfair competition; principles for equitable relief and the impact of bad faith on a practitioner’s case; issuance of preliminary and permanent injunctions; wrongful seizure of another’s goods occurring in the area of “extraordinary” relief; attorneys’ fees; availability of special enforcement remedies; relief and remedies under state law for infringement and unfair competition; and special relief available in counterfeiting cases. Examination of how courts are treating requests for fees after Octane Fitness, including decisions by the Fifth Circuit in Vetter v. McAtee and the Ninth Circuit in SunEarth, Inc. v. Sun Earth Solar Power Co. 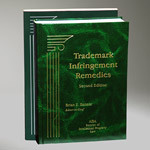 Trademark Infringement Remedies is authored by Brian E. Banner, trademark practitioner with The Banner Firm, LLC, in Washington, DC. Before entering private practice, he worked for Monsanto Company and Munsingwear, Inc., as Corporate Trademark Counsel.